Successfully Added 2 DIN Car DVD Player VW Passat - 8 Inch Display, Android 7.1, WiFi, 3G Support, Car DVR, Parking Camera, GPS, Octa-Core CPU to your Shopping Cart. 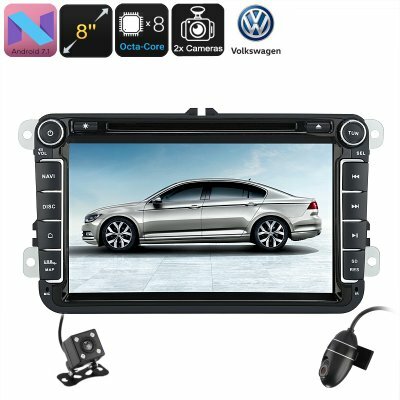 With its stunning 8-Inch display, this 2 DIN car stereo brings all the latest Android features into your Volkswagen Passat (Model 2015 - 2017). Thanks to its Android 7.1 operating system, this car media player lets you enjoy the latest Apps, films and even games anywhere you’re at. Additionally, it also comes with a region free DVD player. With WiFi and 3G dongle support, you’ll be able to download your favorite media straight from the App Store. Thanks to all its entertainment features, this 2 DIN car DVD player makes sure that your passengers will never feel bored again while driving along in your car. Behind its 8-Inch HD display, your car DVD player hides an Octa-Core processor that has been clocked at 1.6GHz. Together with 2GB of RAM, it is capable of handling all basic Android software features without dropping a frame. Naturally, your Dual-DIN car stereo also comes with the regular FM/AM support. It furthermore has Bluetooth so you’ll be able to synchronize it with your smartphone. Once done so, you can listen to your favorite songs or engage in hands-free calls. A 20-channel GPS navigation system will further increase your overall driving experience. With this Android media player in your car, you can be guaranteed that you’ll never get lost again. Additionally, you’ll be treated to a reverse parking camera and car DVR. These car accessories will significantly increase your safety on the road. With this 2 DIN car stereo at your side, you’ll be able to enjoy a driving experience like no other. This 2 DIN car DVD Player comes with a 12 months warranty, brought to you by the leader in electronic devices as well as wholesale car stereos..